Smartphones Bring Happiness And Headaches To Myanmar : Goats and Soda There were half a million mobile subscribers five years ago. Now there are 22 million. And so the Burmese are getting a course in the pluses and minuses of technology. 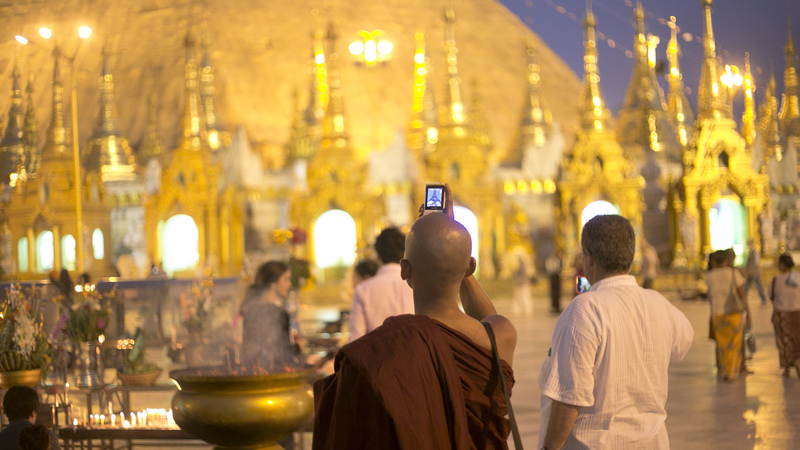 A Buddhist monk takes a photo on his phone at Shwedagon Pagoda in Yangon, Myanmar. The number of mobile subscribers in Myanmar has quickly grown in a short five years from a mere 500,000 to more than 22 million — giving Burmese a crash course in all the benefits and challenges new technology can bring. Myanmar's low electrification rates, recurring power outages and poor Internet infrastructure mean that this growth in smartphones has introduced many of the country's 53 million residents to the Web. "Last year at this time, having a smartphone was a social status," says Phyu Hninn Nyein, knowledge and social impact manager at Proximity Designs in Yangon. Proximity Designs is a social enterprise organization that designs products and services for families in rural Myanmar. "A person who owned a smartphone would show it off by always holding it. 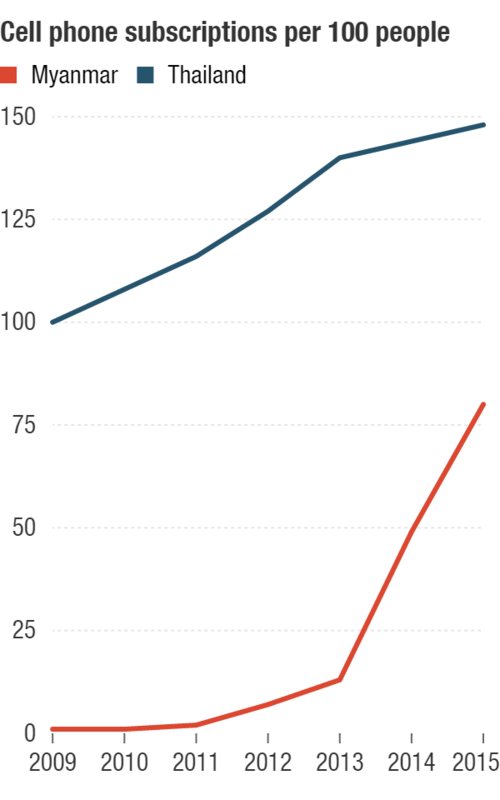 Now, it's a given that there's at least one smartphone in every household. Some households even have more." In 2009, under control of the military government, SIM cards in Myanmar cost as much as $2,000. At that time, just 1 percent of Myanmar's population had cellphones — the lowest level of cellphone proliferation worldwide outside North Korea, according to World Bank development indicators. Even as recently as 2013, SIM cards still cost $250, more than most locals could afford. The average salary in Myanmar is less than $200 a month. A year ago, two foreign companies began selling data-enabled SIM cards for as low as $1.50. Demand was great. Since then, low-cost, Android-enabled Chinese smartphones have become a common sight throughout the country. And a drive through the rural Irrawaddy Delta reveals a frenzied construction of cellphone towers springing from bright green rice paddy fields. The government estimates 80 percent of the population will have cell phones by the end of this fiscal year, which closes March 31. The expanding network of cellphones has enhanced more than just personal lives: It's benefiting agriculture, health care and disaster relief in a place that has had more that its share of tragedy. In August, severe flooding in Myanmar has killed at least 100 people and affected more than 1.3 million others. With greater access to mobile phones, aid workers have been able to more easily locate flood victims than in the past — for example, in 2008 when floods from Cyclone Nargis killed more than 130,000. "I have seen a lot of relief effort conducted via smartphones," Phyu Hninn Nyein says. Meanwhile, the growth in smartphone use by farmers is helping move Myanmar's agriculture sector forward. Jim Taylor, co-founder of Proximity Designs, says his group is piloting an app that will allow small-plot farmers to have access to agronomists and reference guides on demand. The company also is developing sensing apps that would measure soil moisture and show farmers the exact dimensions of their plot. "Precision technology is emerging on farms in America, Europe and Australia," Taylor says. "We want to see the same applicability to the small-holder farmer in Myanmar." And while Myanmar was ranked dead last for health care service development in 2000, new phone technology is encouraging a shift. One successful app called maymay — Burmese for "mother" — gives month-specific pregnancy advice and referrals to doctors. 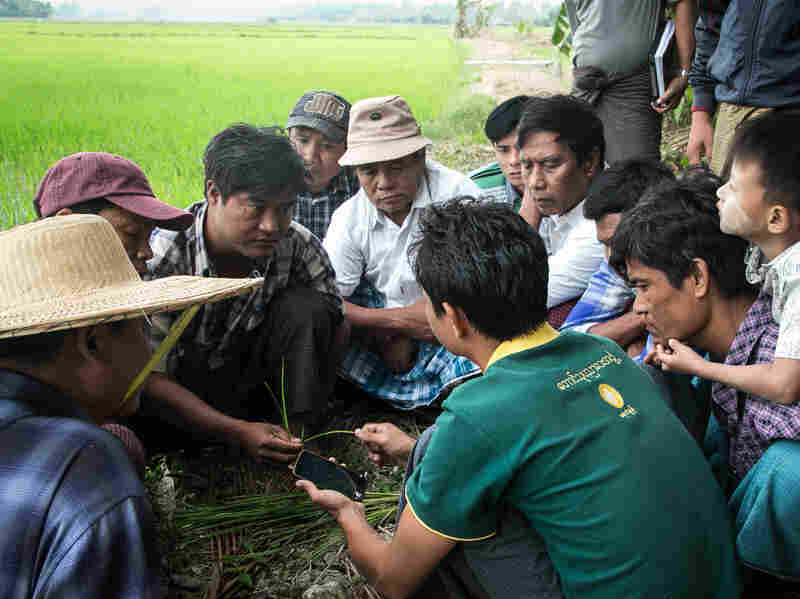 Farmers in the Irrawaddy Delta get a lesson in the Farm Advisory Services smartphone app, which can connect them with agricultural experts. But Burmese have also faced challenges due to the quick adoption of smartphones — and social media. People share things online and don't fully understand the consequences, says Kenneth Wong, a Burmese-American author and blogger. "And there are really a lot of false things — Photoshopped, doctored images that I've seen being shared — the kind of thing that sophisticated Web users would be able to pick out as ... illegitimate." Rumors that one powerful monk, Ashin Wirathu, spread on Facebook were widely cited as the cause of anti-Muslim riots last year. "There was an unconfirmed rumor about a Buddhist woman being raped by tea shop owners, who happen to be Muslim brothers," Wong recounts. A "dubious" news source published the rumor, he says, and "people started sharing it online." After the monk shared his views on it, the story "went viral and, almost, the very same night, there was a mob that attacked that tea shop," Wong says. Two people were killed in the riot: one Buddhist man and one Muslim man, according to The Wall Street Journal. "I was embarrassed," Wong says. "I was raised in a country where I thought people were known for hospitality and tolerance, and this was a different kind of Burmese energy that I saw." Prominent Burmese have stepped up in an effort to educate people about the power of social media. In 2014, Burmese blogger and former political prisoner Nay Phone Latt created a campaign called Panzagar, which means "flower speech," to encourage Myanmar's Internet users to think about the consequences of what they say online. The campaign encouraged people to take a selfie holding a flower in their mouths. Facebook picked up on it — introducing a Panzagar "sticker pack." 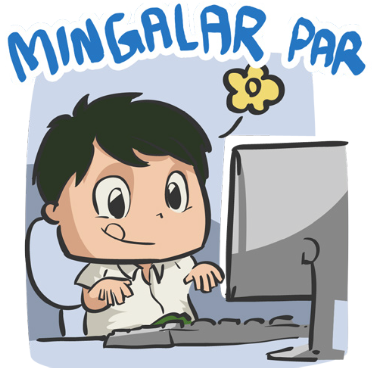 Millions of Panzagar stickers are shared in Myanmar each week, according to Facebook: The company says it's their "first instance of trying to affect social change via stickers." Facebook also rolled out a series of Myanmar-specific options to report disturbing content. In April, Muslim Rohingya activist Wai Wai Nu began a #MyFriend campaign on Facebook, in which people pose for a photo with a friend of a different religion or ethnicity — then hashtag the photo. In addition to promoting tolerance, Burmese are also taking to social media to bring about government transparency in Myanmar's nascent democracy, which only transitioned from military rule in 2010. People discuss political issues and report on injustices they witness. Myanmar's first election in 25 years — and following what amounts to five decades under military rule — is set to take place on Nov. 8. "The citizen journalism approach that previously would have been unthinkable is now possible," Wong says. "People are uploading videos of evidence of use of excessive force by Burmese authorities. That is the kind of thing that I never would have thought was possible, or people would dare to do, when I was growing up."